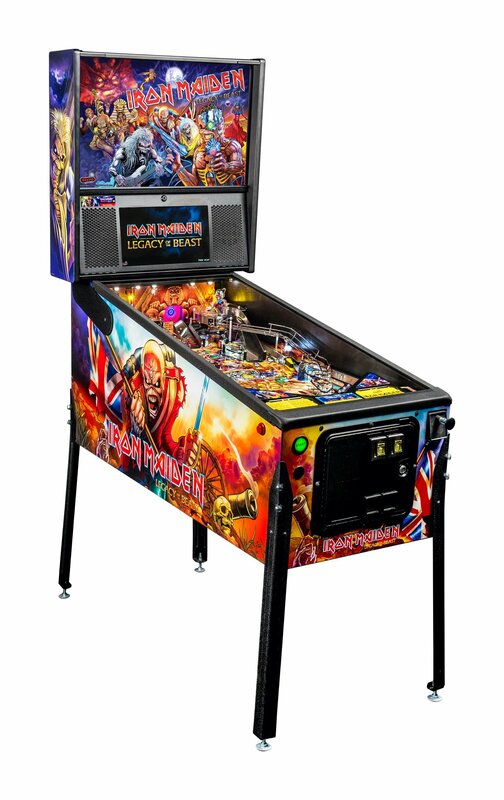 Iron Maiden: Legacy of the Beast is the newest title from Stern Pinball! 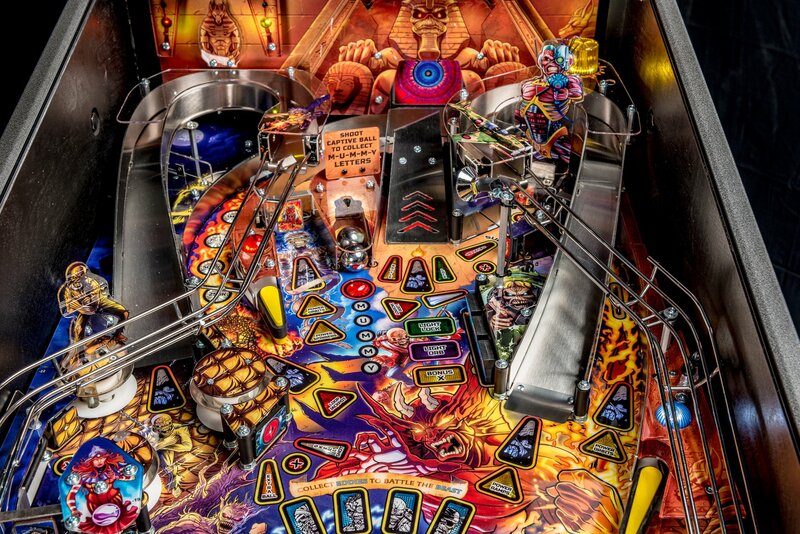 Below is an in-depth Overview of the machine, and Five Likes and Five Dislikes on the Pro version, based on the information Stern has released and the stream of the machine from Dead Flip. Watch the full stream here! 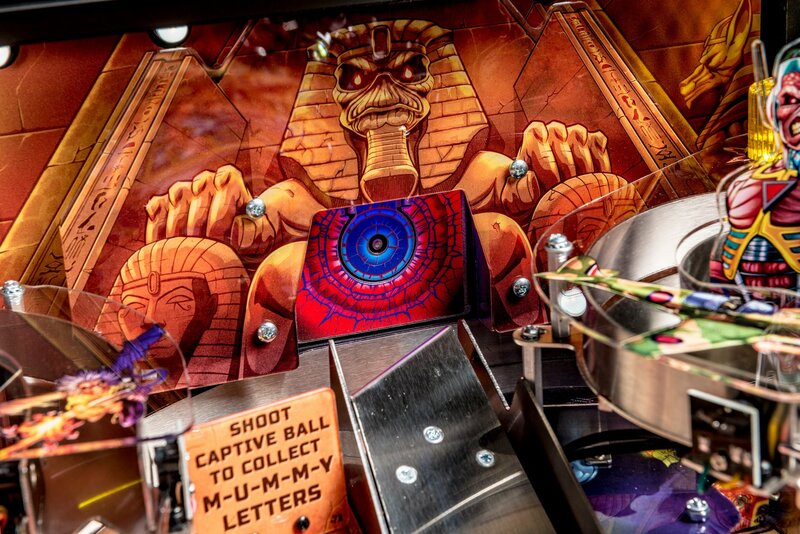 You have entered a MULTIPLIER FREE ZONE. Well…-ish. We’ll probably slip a few times and use the word “multiplier”. But in general, we’re to go through the main rules in the game and discuss how to progress through the game ignoring multipliers. 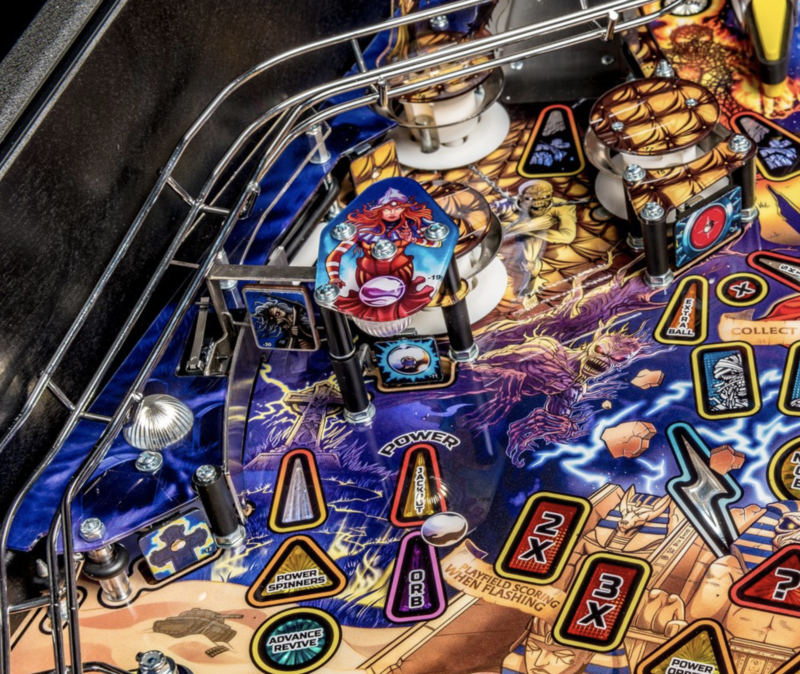 Nothing wrong with multipliers, they’re great, but they’ve been covered extensively elsewhere – if you want explanations of the multipliers – check out this in-development rulesheet on Tilt Forums. For a great explanation of all rules, check out this back stage pass from Stern! 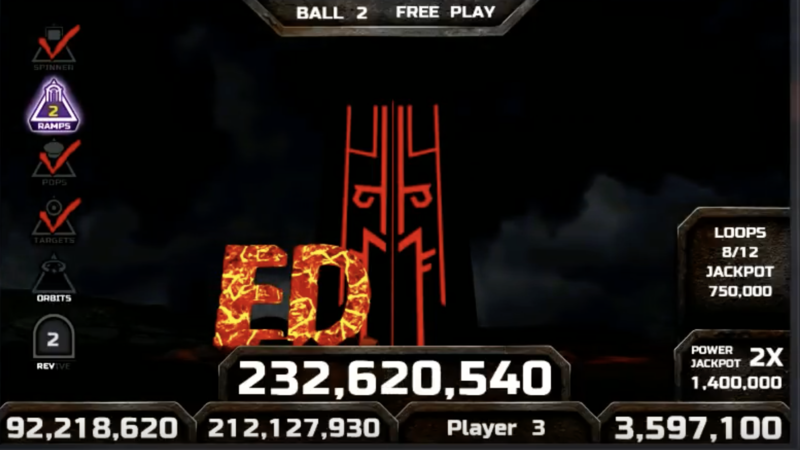 Now you’ve collected all the Eddie Cards which lights Number of the Beast Wizard Mode! 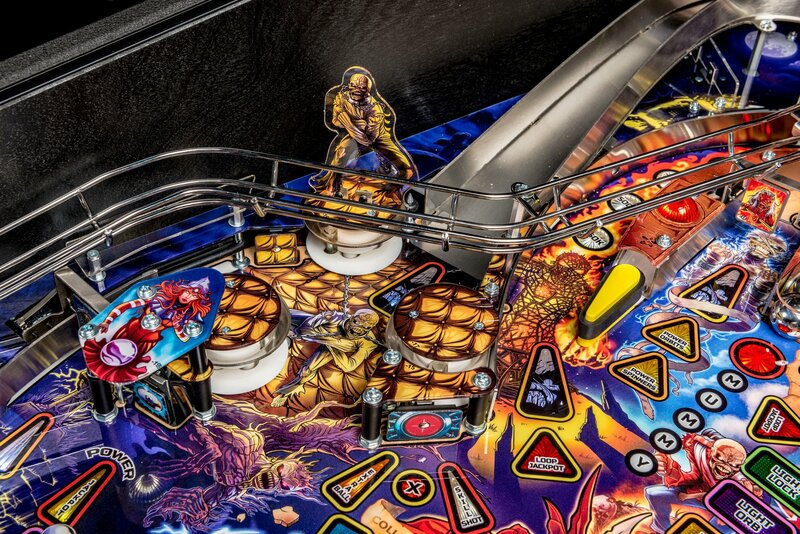 Note – this wizard mode sounds very cool and we don’t want to include any spoilers here. If you want to read about it, go to the last page of this PDF and check it out! “Complete four objectives in order as quickly as possible. 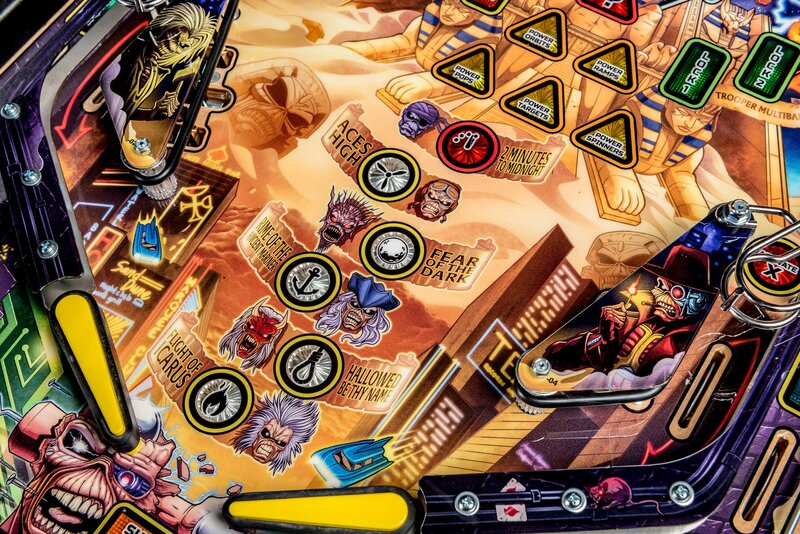 There are two levels to each Eddie Card you can collect. 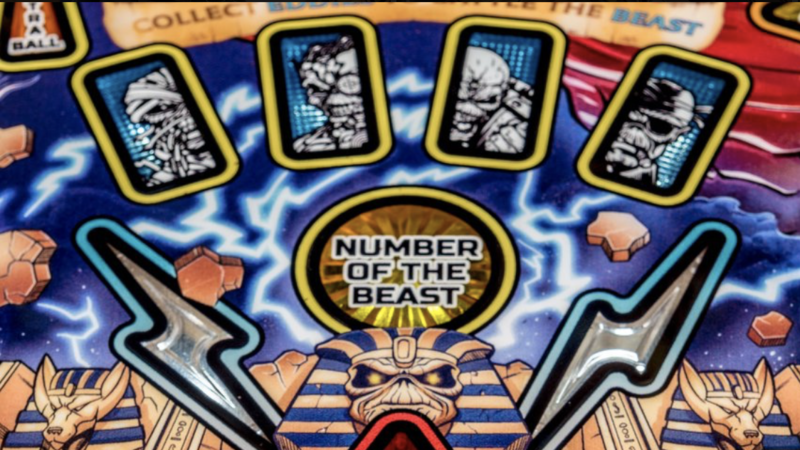 Collecting the first level gets you to the Number of the Beast Wizard mode. 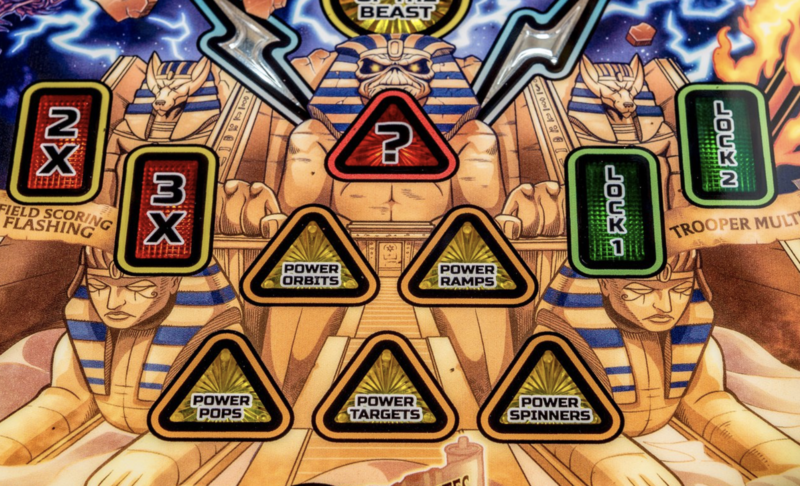 Collecting the SECOND LEVEL of each Eddie Card gets you to … ??????? The structure of the rules is very well done, and it feels like there is something for everyone. 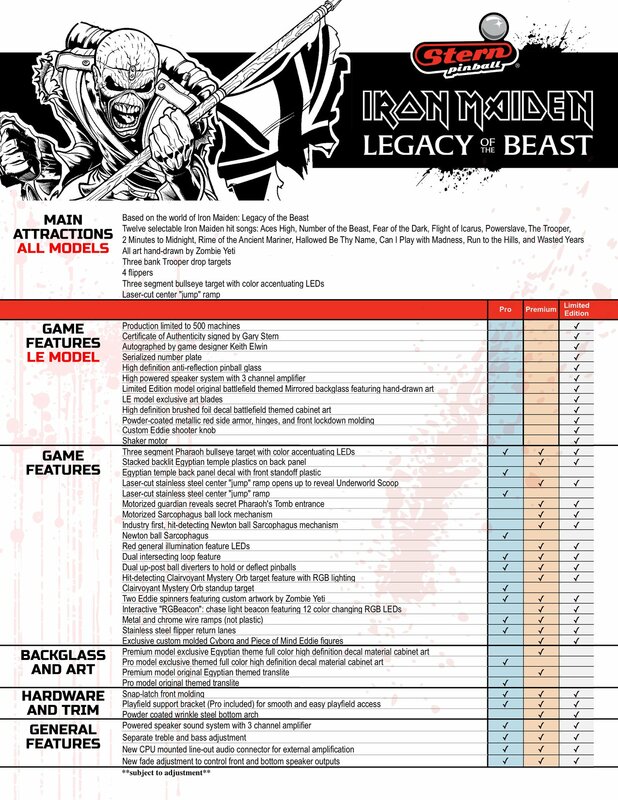 There are a lot of different options on what to play for on this game without being overly complex. Go for modes, or go for Power features, or go for multiballs, etc. 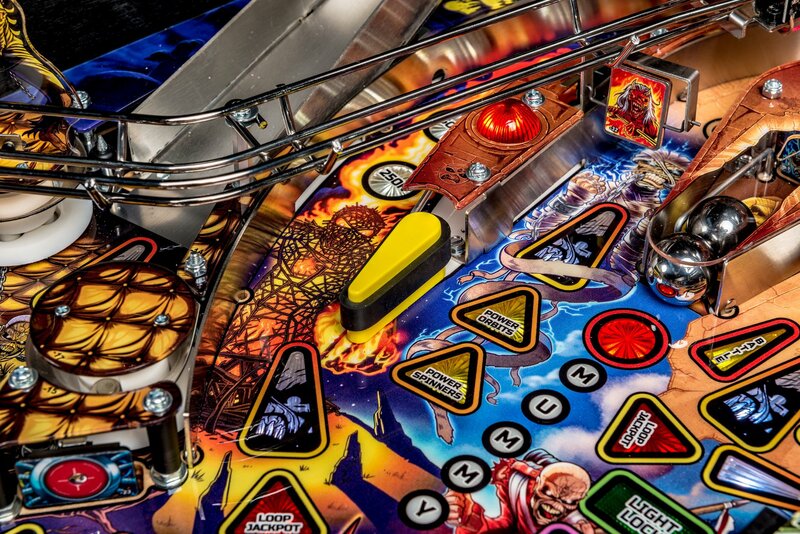 For the beginners, a multiball isn’t too difficult to start. For those that like a mode based game and progressing through the game, the rules are pretty straight forward and easy enough to understand. For competitive players, there are many creative multipliers and lucrative scoring opportunities. 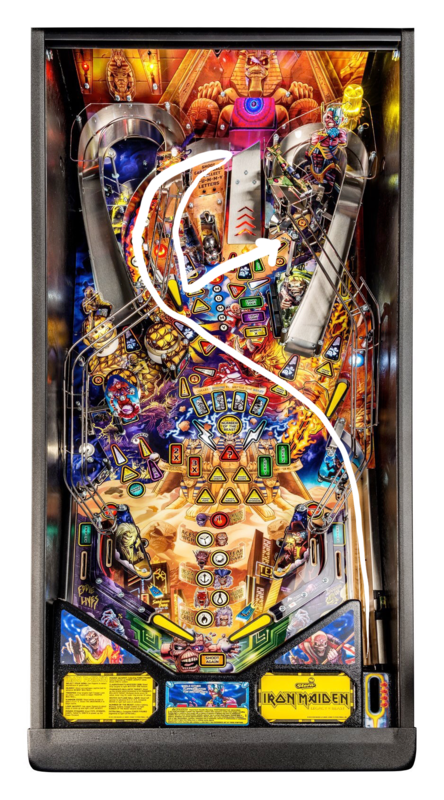 I think my favorite multiplier is the upper left flipper – if you hit the loop with the flipper held up you get 1x the value, but – as a more difficult shot – leave it remaining down is multiplied 2x. People are raving about the layout of this game. 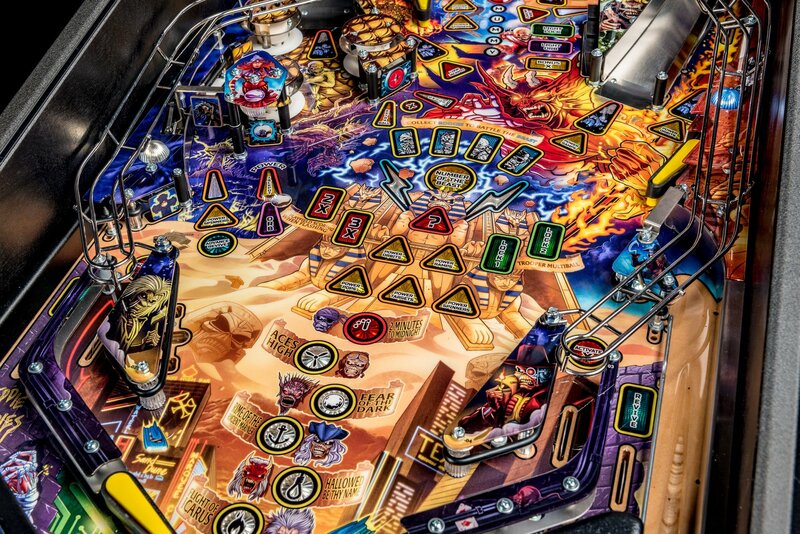 To me, the rules are even more impressive than the layout, both for the casual player and the competitive player – as just mentioned, it feels like there is something for everyone. Sometimes Stern layouts can remind you of previous layouts (see: Guardians of the Galaxy and Metallica). This is a fresh new layout, never seen before (well except Archer) and it doesn’t look like any other game. The shots are not totally foreign, but they are compiled in a new take that looks satisfying to shoot. There is even a dedicated alley pass shot target! 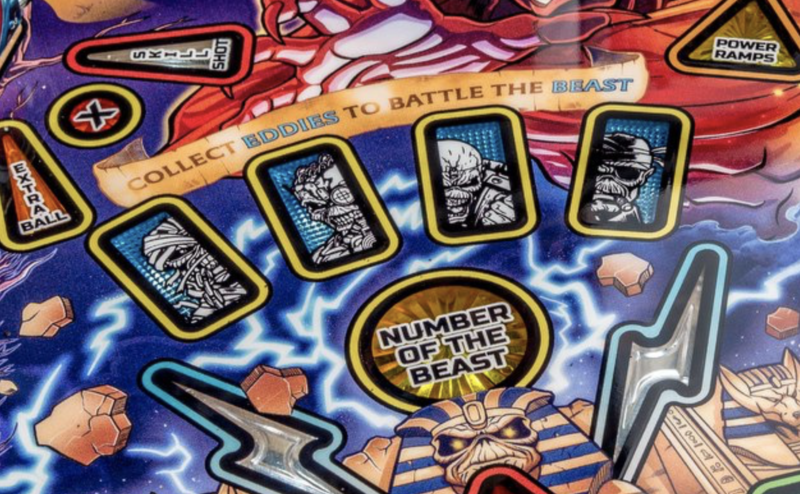 It is the Gravestone Target or the Shatz Target, and it spots a shot that you need at whatever point you are in the game. No idea what “Shatzing the inlane” means? 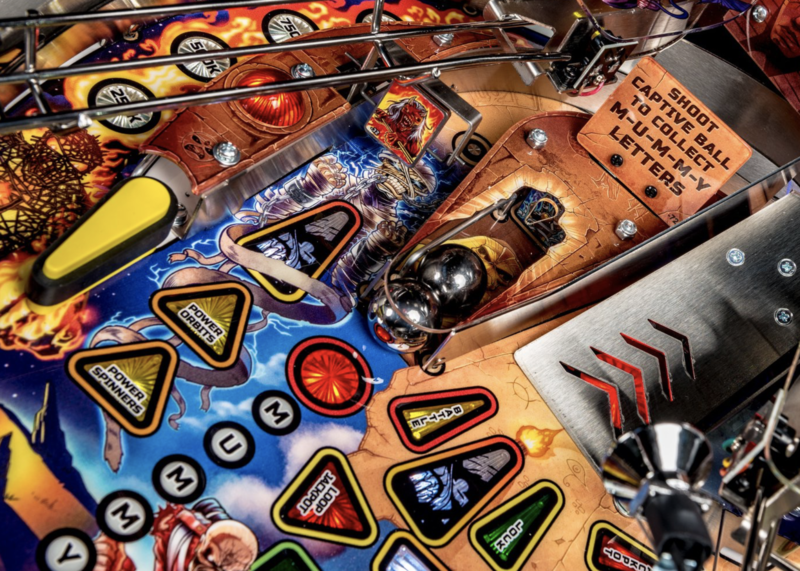 It was named after pinball player Neil Shatz. Here is an example of what “shatzing the inlanes” is. 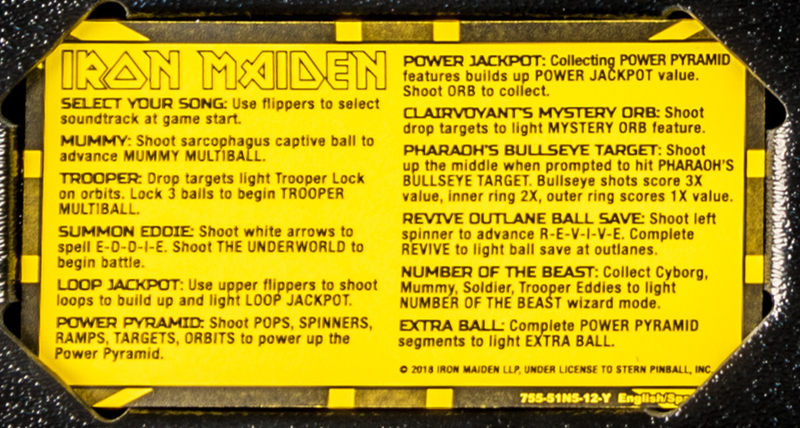 And here is how it works on Iron Maiden! Tons of detail, and overall a great looking machine. Factor in working with a licensor that has a specific art style, and Zombie Yeti pulled this off well. Except need to add some more Eddies. Just kidding, there are plenty of Eddies already! Mom’s spaghetti. 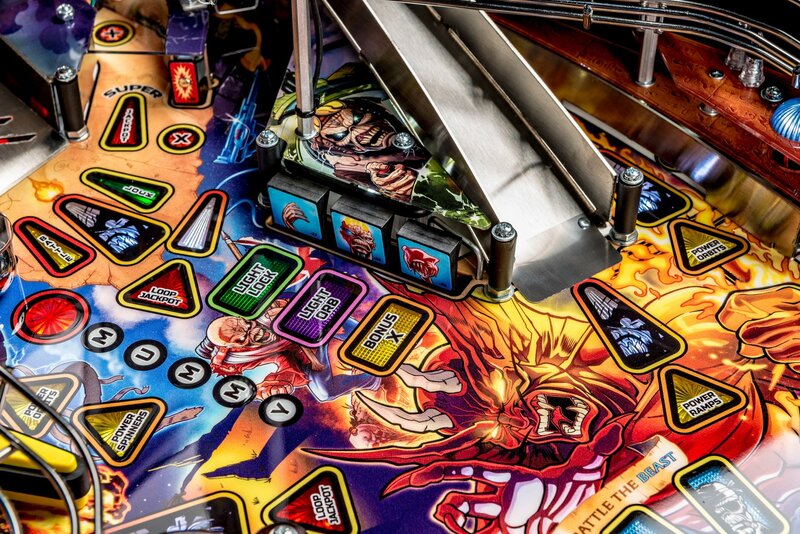 Whether you like Iron Maiden or you don’t (raises hand), they’re upbeat music fits a pinball machine well. 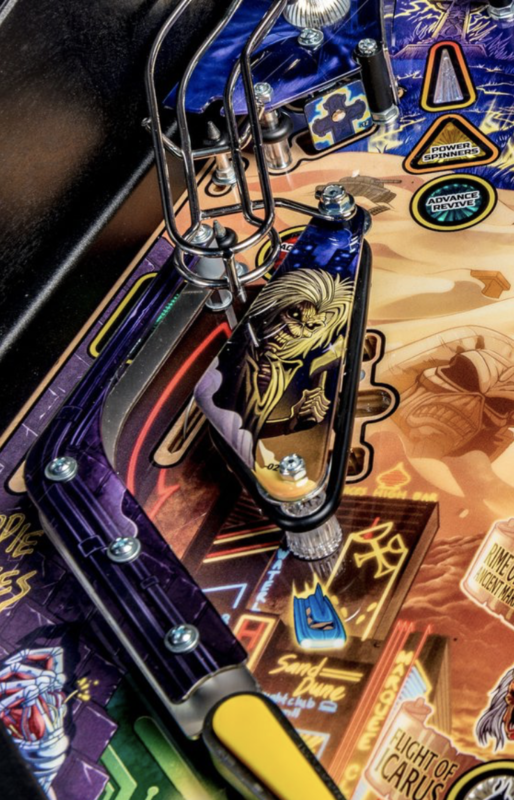 There has been frustration in the past with the status of code when Stern releases a pinball machine. This machine is released with 0.92 code and is expected to reach 1.0 code very soon. They also added the service rails back in instead of the pegs. It has two spinners, which as of recently have not been included on Pro models. And what is the last Stern Pro with four flippers? It sounds like we’ll have some more features with the Premium version, but there aren’t really any toys on the Pro version. There are a few cool animations on the display, but overall the animations feel somewhat…uninspired. This may be more due to licensor pickiness than anything else. 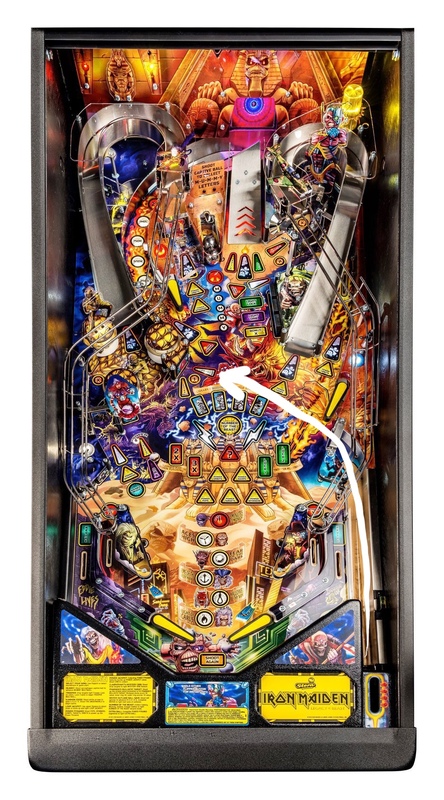 While the information on the display is shown in an effective way, with the your scores at the bottom, the Power feature progress on the left and other current information on the right, the font looks like it should be better integrated into the theme. Feels like it should be in a more striking typography to fit the theme. Some people love this shot, some don’t. So far we’ve been hearing this shot is easier than it looks, which is a good thing. At a person of my skill level though, hopefully it won’t be brick city trying to go for the left ramp. For some this is a dream theme. For me, I wish a different theme got this unique layout, artwork, and ruleset. Obviously since Stern sold out of the Limited Editions before anyone had seen them, there are enough people that like this theme to make it a success. How many of those sales are based on the layout and features and rules as opposed to the theme itself? Hard to say. Am I just bitter? Yes, probably, and a little jealous of people that love this theme. I want to love it!